HÀ NỘI – The Vietnam Dairy Association has asked the Government and ministries to introduce new dairy products for the school milk programme aside from fresh milk to ensure adequate nutrition and a diversified diet for children. 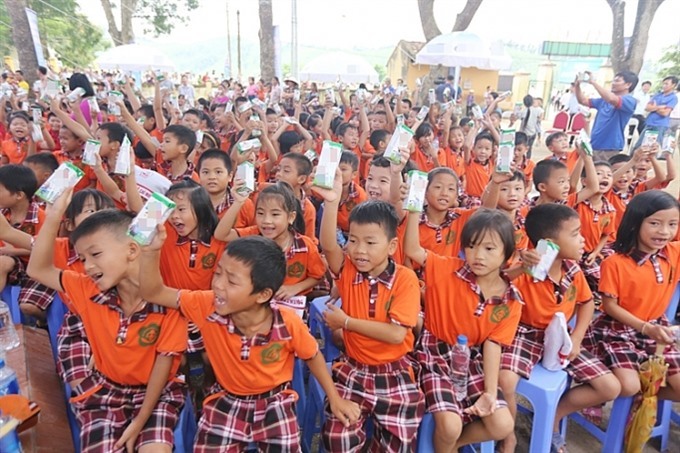 Trần Quang Trung, chairman of the association, said that the target of the school milk programme was to cut malnutrition among children. As targeted, all students in poor districts and 70 per cent of students in urban and rural areas will be provided with milk by 2020, helping increase the heights of boys and girls by 1.5 and 2 centimetres respectively. To implement the programme, the Government has called on organisations, enterprises and individuals to participate, especially in poor areas. According to the Ministry of Health, Việt Nam had made significant progress in improving the health of children. However, a quarter of Vietnamese children still suffered from malnutrition, while the average height of Vietnamese people was still lower than the global average: men by 13cm and women by 10cm. The school milk programme aims to benefit nearly 12 million pre-schoolers and elementary school students nationwide.